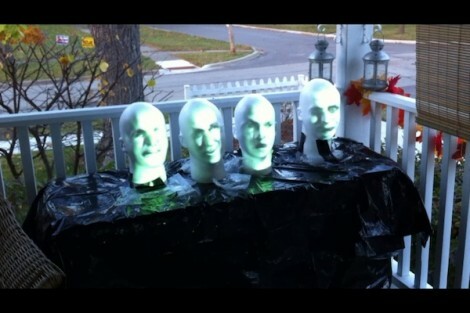 Here’s a Halloween prop leftover; [Chris] built his own version of singing heads from Disney’s Haunted Mansion on his porch for last year’s ghoulish decor. A projected image of actors singing a spooky song gives each of the four Styrofoam mannequin noggins its own digital life. There’s an optical sensor on the porch stairs that is tripped by unsuspecting candy-seekers. An Arduino monitors the sensor and uses AutoHotkey to start the video clip on a netbook. Check out the video after the break to see the finished display do its thing after dark. nice simple code too. and check out some of the other projects on his site. I had no idea you had to season cast iron skillets! What about the main rooms and ballroom in the haunted mansion? Don’t they use some kind of projected image onto a clear woven fabric or something? Now THAT would be COOL!!! I have a feeling this is one of those things that looks/sounds 1000x better then what can be captured on camera. @bbsux That illusion is called “Pepper’s Ghost” and it actually quite old. It’s really not too hard to pull off but it helps if the viewer is in a stationary location. You can see a better explanation on Wikipedia. That’s awesome. I’d love to see what its like in real life. very cool. One of my favorite parts of the ride too. better, thanks for the link. Great work btw. That is absolutely genius, it is like Disneyland on your porch. How much does something like that costs? Would love to implement some singing heads at my house next Halloween. So I guess somewhere around $80 if you had to buy everything new. Tamsin Heineman liked ESPboy.edu: beyond the games platform with WiFi. iliketoredstonesometimes liked DLT one - A Damn Linux Tablet!. Tamsin Heineman liked 40-fps 16-bpp platform game on a Cortex M0+ board. Tamsin Heineman liked CW PI RASPBERRY PI ZERO. clay liked pcbtc (GaN edition). Tamsin Heineman liked Skeleton Attiny85 Handheld. julianoleal86 liked ESP Soil Moisture Sensor. Yann Guidon / YGDES liked Pseudo random number generator.